The fast paced, 90 minutes long, black and white movie Breathless (À bout de souffle), features the escapades of its protagonist Michel, but most of all is a quintessential representation of the New Wave, the French movement in cinema. Besides Michel, we are introduced to Patricia, a young American journalist, trying to succeed in Paris. This fast paced crime drama is based on the two components of the plot, first the criminal activities of Michel, that consist of stealing cars and murdering one policeman, and the other being his obsession with Patricia. The majority of film we witness just that, him stealing cars and his interaction with Patricia, who is not so sure about her own feelings toward her French lover. Patricia is confronted by the detective who is working on the case of the murdered policeman and blackmails Patricia with her alien status in France that would be in danger should she not reveal whereabouts of her lover. Patricia is confronted morally, but decides to betray Michel and calls the police giving them information about him. 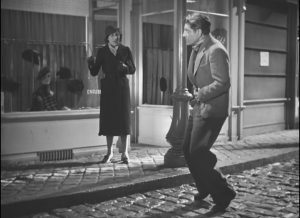 The movie ends with Michel trying to escape, running down the street and being shot from the back. The very last shot we see is Patricia’s face while she is looking at him, sliding her nail across her lips. 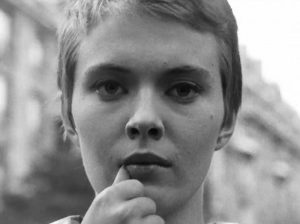 As mentioned before, Breathless is the emblem of the French cinematic movement called New Wave. The movement was considered by its members not as something organized and institutionalized, but just a large group of directors creating quality films. The decline of mainstream French cinema after the World War 2, mostly caused by administrative and regulatory reasons, provoked several members of Cinemathequeto foster the future growth of the new direction, represented by movies made by Jean-Luc Godard, Francois Truffaut, Jacques Rivette, Jacques Doniol Valcroze and Claude Chabrol. One of the main points of the movement was the reconstruction of the film language, previously misused and proved to be a dangerous tool (especially during the World War 2). Cinema developed, in the course of previous decades, a set of conventions and grammar that aimed at making the spectator unaware of the mere experience of watching the moving images. That means that the main goal was to make a spectator feel like the movie is part of the reality, that the chain of events happening on screen is not part of the medium they are watching, something prerecorded, but reality taking place right there, in front of our eyes. This led to strong emotions from people who were not able to process the movie properly as fiction. This type of moviemaking resulted in a certain amount of power that directors and producers have to use the medium in manipulative ways, in order to achieve certain ideological or political goal. Like in the time that led to Breathlessand New Wave, today we face a very big divide between commercial and more independent cinema. In the city where I live this divide is most visible in the way movie theaters work. There are shopping mall based high-end cinemas that are usually more expensive and have a whole industry of on-the-side entertainment to it, like 3D, food court, collection of points, etc. On the other hand, small cinema and cultural centers downtown Belgrade offer a variety of European and less known movies that are not meant to be seen in 3D and do not include any of side entertainment. These independent cinemas do not show trailers before movies or try to lure audience with commercials, and projections start right on time. The divide is therefore greater, since the identity of the place that shows movies corresponds with the offer, so you will not be able to go to high-end commercial cinema for a movie that’s not from a major production company from the USA. Another very important aspect of it is the loss in creativity that this causes. The innovation is lacking from contemporary commercial cinema, in a way in which most movies can be seen as having some kind of a mutual formula. This kind of a universal formula that fits many different movies can be, in a way, applied on many contemporary films as well. The current trend of movies based on the conflict between good and evil (like superhero movies), that again follows the same structure or formula, goes even further, as it uses the visual effects to compensate for the lack of boldness and originality. Also, the infamous superhero genre may use identity politics to acquire certain kind of prestige that may not be usually attributed to this genre, like “Wonder Woman” or “Black Panther”, that were almost universally critically acclaimed, with the score of more than 90% on Rotten Tomatoes (a website that measures the amount of favorable critiques from professional movie critics), but still, does not go far away from the limitations of the superhero genre. This kind of a trend I see as a result of a highly capitalistic way of producing movies. The big production companies have stablished a certain market with their target group that is pretty loyal (loyalty is built by having a brand, like Marvel) and there is a certain set of elements of the plot that usually bring profit, so introducing new elements, changing the existing ones and going “off script” would be a big risk for a profit that is already guaranteed. That is how a big capital is held within a certain niche, without overcoming its limits in the highly competitive market. Why did I talk about it this while discussing the movie Breathless? 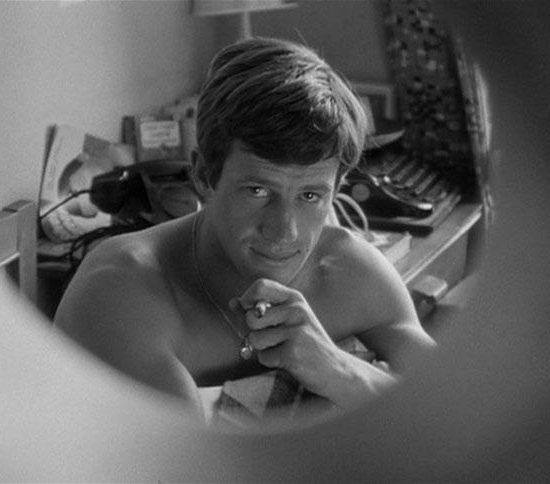 Because the movie aimed at provoking the established power structure within cinema, dealt with the history of a medium in a way where self-reflection and meta reference was a crucial element to deconstruct the “seductiveness” of the film, show and educate the audience on how the medium works and what techniques does it use to seduce. We now, in the contemporary world, have a situation where conformity plays a very important role, and everything that is not part of it is being marginalized. We almost have one powerful center with a lot of resources, that is doing everything it can to preserve the position of power, and the periphery with less resources that caters to the niche audience, usually in small downtown cinemas. The way New Wave dealt with movie conventions that were meant to mask the fact that we are watching a movie and tried to expose it in a original way is what I appreciate about it, as someone who watches movies in 2018 and sees a lot of similarities to the crisis. 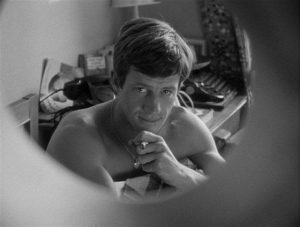 Breathlessis a non-commercial movie that left a really big mark in the history of the movie by being bold and rebellious towards itself, it is an example of anti-capital oriented, non-crowd-pleasing piece that ended being a widely recognizable title even half a century later. Set in the small city of Le Havre, the movie “Port of Shadows” tells us the story of misfortunate destinies of several strangers whose paths intertwine in the small port town in France. This tale spread throughout just a couple of days follows a soldiers who deserted and tries to escape to Venezuela from Le Havre, and his encounters with different people in the attempt to do so. His plan is interrupted when he starts an affair with young Nelly, who is already involved in the disappearance of her former lover and is being the object of obsession of Lucien, a local criminal. Another important character is Zabel, her godfather, who is in love with Nelly and is ready to do anything to keep her away from other men. For that very reason he kills Marcel, Nelly’s former lover, and frames Jean. The movie ends up tragically for Zabel, who is murdered by Jean, and Jean who is murdered by Lucien in the very last scene of the movie. The movie is marked by a very pessimistic setting, besides the movie being set in a port that is often foggy (hence the title Le Quai des brumes, “Port of Fog” in literal translation), we encounter many characters with sinister traits who have a lot of power to achieve their goal, that most of the times means keeping Jean and Nelly separated. Fog plays an integral part in the movie, it happens very often that we just see silhouettes, rather than clear depiction of people, and uncertainty is generally present in the movie. Dialogues and scenes with only Jean and Nelly in it are notably most “poetic ones”, they are usually marked by a very poetic exchange of ideas and affectious expressions between them (contrary to how people usually speak) and are followed by a close-up of their faces, that convey emotions of affection and lament. This can be interpreted as the characteristic of the Poetic Realism, the movement in French cinema of the 1930’s that the movie “Port of Shadows” belongs to. 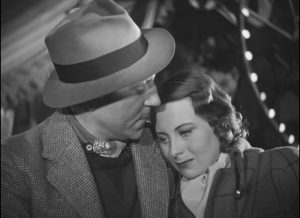 The movement is marked by the tendency to showcase characters in desperate circumstances (in the case of this movie, Jean who is a deserter trying to flee from France), who have a glimpse of hope and happiness (for example, romantic one, like in our example, Jean is sceptic in the beginning, but eventually falls in love with Nelly) that ends up abruptly and tragically, usually by death of the character (Jean getting shot by Lucien after reaffirming his relationship with Nelly). Identity and manipulation of it is another a very important segment of the movie. Let us take a deeper look into the series of scenes where Jean tries to take over an identity of a painter in order to escape to Venezuela without being noticed. He gets the suit and equipment of the painter and gets rid of his army markings and clothing. He is soon to be caught in the screwball comedy like series of events (even the date of the release of movie coincides with the emergence of screwball comedies), with the renowned passenger of the ship trying to help him get on the ship by using his personal connections. What Jean did not count on is to acquire some knowledge on art and paintings, and he is forced to participate in a comedic exchange with his new friend, who is very interested in art and does some naïve art himself. When being asked about his insight on art, Jean starts expressing some random thoughts that he just came up with and that may sound profound, but in fact make no sense, and his partner in the conversation goes along, without noticing Jean’s charade. The manipulation of identities is once again used when Zabel tries to frame Jean by placing his military marking and clothing by the corpse of Marcel, thus making it seem like the real perpetrator is Jean. The exchange of identities that leads to confusion and the risk of being exposed was a well-established tool in comedy that fits really well into the Jean’s storyline. This series of events does not seem to fit to the mood of the movie as a whole, it is more light-hearted and comedic, while the rest of the movie is filled with jaded characters and seriousness of rugged life. Another very interesting segment of the movie was the melodramatic premise. Buckland (1998, Film Studies. London: Hodder and Stoughton) lists the following as ‘primary attributes’ of melodrama: women-dominated narratives, the perspective of the victim, moral conflicts, omniscient narration, twists and reversals, chance events and encounters, secrets and dramatic knots which complicate the plot. We can see many of this elements in “Port of Shadows”. 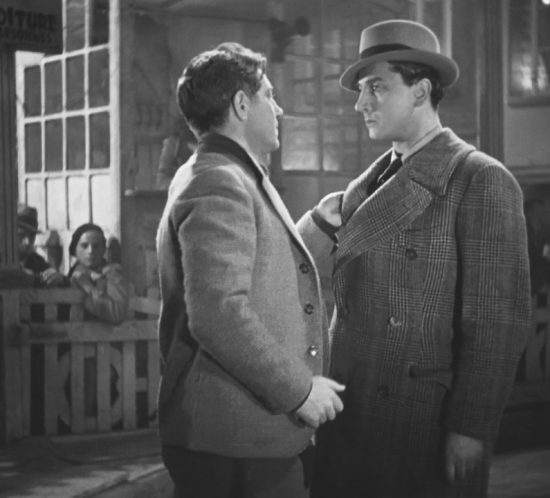 The narrative in this case is not very women-dominated, on contrary, there is an evident lack of female characters in the movie, but some other elements of melodrama are undoubtedly present, most notably twists and reversals (Marcel ending up murdered, Zabel trying to frame Jean, Jean killing Zabel and Lucien killing Jean). Also, there are many chance events and encounters, characters in this movie meet in the most unexpected, but strangely convenient times for advancing the plot, like Jean coming right on time to save Nelly from the arms of her godfather, Lucien meeting Jean and Nelly during the carnival ride by chance, an encounter that ends up in a fight and Jean’s death. The destinies of all characters in the movie are intertwined in a net of encounters. Also, the romance between Nelly and Jean complicates the plot when the love interferes with Jean’s plans, and actually get him killed in the end (if he had just stayed on the ship, he would have survived). The movie represents a very interesting piece made just before the outbreak of the World War II, but it does not deal with troubled times and threatening political and social forces. The movie deals with inner demons and vices of a small town, without ever referring to a greater social structures that may affect or influence this (another feature of Poetic Realism). In all this, I found also interesting elements of melodrama (genre particularly dear to me), suspense and comedy, that may not sound as complementing to the general dark image of the movie, but somehow go along just fine, in the case of this movie. This excursions to different themes made this movie very intriguing and interesting to me, it is a movie that offers a variety of topics. “Port of Shadows” may ends tragically and bear a certain harshness to it, but it does leave a very light hearted impression in the end. The movie has a very pessimistic premise, the main character tries to reach happiness, but fails in the last moment, just before running away with his love he gets shot. Regardless of this, the movie successfully escapes this pessimism by showing us that his love with Nelly was sincere and brought some contentment to his jaded personality. The movie comes full circle without the happy end, but that contributes to the overall charm of it. Cabiriais an Italian film from the beginning of the 20thcentury, the year 1914, to be precise. Here I will discuss the importance of the movie for the cinema of the time and what is its significance today. We can start deliberating on the importance and greatness of the movie by stating the fact that the production of the movie influenced greatly other projects of its production company, Itala, and that it brought a great success to the beforementioned company. This more-than-two-hour long movie marked a milestone in the history of cinema by it’s usage of new technological features and at the same time conveying a complex story with a plot and fairly distinguished characters. One technological innovation that was very important for the future cinema is a tracking shot, made possible by placing the camera on a dolly and using it to follow characters as the move, zoom in, include the parts of the frame that are higher or lower, etc. 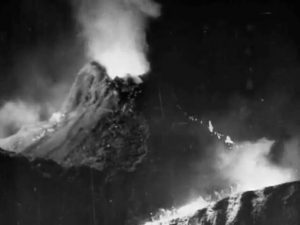 There are other features that were original or innovative in Cabiria, one being the volcano eruption showed in the movie, the usage of internal and outside setting and lighting, portrayal of fire, battles that include a lot extras and some very elaborate set designs. Besides all the technological advances I mentioned we cannot deny the complexity of the plot in Cabiria. The movie follows characters that have relationships (father-daughter, friends, fellow Romans, etc) and identities, they have goals and they have strategies to achieve this goal, etc. These are just few points in the plot that demonstrate this. Besides its temporal dimension (being historically marked), important thing to notice is also a spatial dimension, the movie takes place in different places and it successfully communicates this (using set design, costumes, intertitles). The project was without a doubt ambitious and represented an example to be followed. 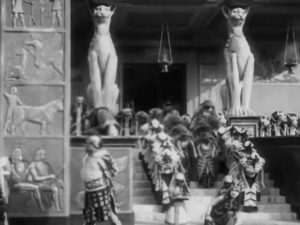 Although I enjoy watching movies, this was a rare occasion for me to see a silent movie, and I will now reflect on the cinematic experience of watching Cabiria. Regardless of the existing plot and narrative tools used to convey a story, I found it pretty challenging to follow through the movie and grasp every detail. That made me think how sound in the movie and Hollywood/mainstream movie conventions made of us “lazy viewers”, making us put little to no effort while watching a movie. Mainstream modern cinema created the tools that help us watch a movie today without it being a great endeavor, the characters’ backstories are introduced clearly in the beginning of the movie, we are completely aware of the location, identities, relationships of the characters, their inner worlds and thoughts, etc. While watching a silent movie, we have to pay closer attention to the facial expressions, body movements, posture of the protagonist in order to learn anything about their inner world, emotions or thoughts, and even then we may come to a wrong conclusion or understand something falsely. We have to pay closer attention to the status symbols, if we have, for example, 5 female characters in the frame, we have to see how are they dressed to conclude who is a servant and who is the ruler, if we are witnessing a fight, we have to recognize different costumes of opposing armies and use our history knowledge to understand who are Romans and who Carthaginians for example, etc. In modern day cinema, individual identities are usually clearly marked in a dialogue and not left to our visual interpretation. Besides the technical part of the movie, we should also comment on the content of Cabiria, and what I found specifically interesting are characters and the relationships between them. As I mentioned before, the character called Maciste plays an integral part in the success of the movie and that character continued on living even after Cabiria, he experienced many sequels afterwards and the actor starred as Maciste in all of them, just without black-face. The character was presented as mulatto (without being strictly of white or black race) and the white actor was chosen for the role. 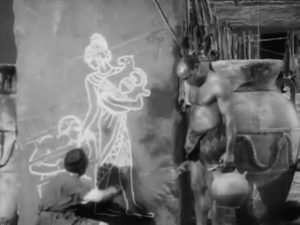 The character was not completely black “signals an otherness that is not completely other, one who embodies both Romannes and Africanness, and thus a much more ambiguous figure” (Reich, The Metamorphosis of Maciste in Italian Silent Cinema, Film History, Vol 25, Issue 3: 38). This can be understood by putting the movie in the context of the Italian society of the time, on the one hand, Italy faced the conflict with a colonized territory, and on the other, the project of the national and identity-based unification of Italy was taking place. That means that the content or the narrative of a movie can be tied to a broader social and political context of a certain society or culture. 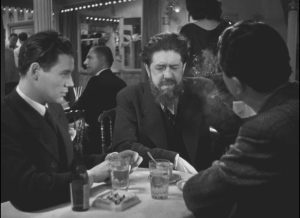 Whether we talk about screwball comedies and their gender bending tendency or socialist cinema and the representation of the state-apparatus, we can always find a correlation of a certain time, political and social context and the narrative of a single movie. One very important thing in this movie I want to put an emphasis on is the role of the little Cabiria in it. Besides the name of the movie, her agency in it is highly limited and she is just the object that drives the plot where men have dominant roles (she is not even present during a big portion of the movie and in some of the most important and memorable scenes). Fulvius Axilla and Maciste dominate the movie in their presence, their activities and popularity, and that the role of Cabiria is very passive. Characters in Cabiria can be seen and understood as standard for the time, in terms of race and gender representation, national identity and masculinity. Technological advancements are not the only thing that gives us an insight into the context of a certain movie, but also the plot and content of it.